Since the shutdown puts non-essential government employees back on their couches, that means all the server and network admins have FLOODED Xbox Live and the Playstation Network. While those guys are out fighting zombies, pwning n00bs, and leveling up, their servers and networks are unattended and shut down. What’s that got to do with SEOs? 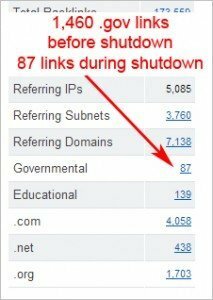 If your site gets a boost in ranking from .gov links (if you have them, it does) some of those sites are now returning 404s in the absence of the nerds who care for them. nasa.gov along with many other government sites currently 404s! 1,460 .gov links before the shutdown. 87 after. Ouch. Brace yourselves… if your site depends on .gov links, you could drop like a rock. It could take a long time to recover your ranking once the .gov sites come back. It could trip a filter for over-acquisition of links in a short period of time. I assume Google would “fix” that because that would be a monumental FAIL if not.